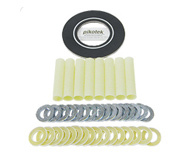 Pikotek Flange Insulation Kits are designed to work in conjunction with our insulating gaskets (Pikotek VCS, PGE and RC) to effect the complete electrical insulation of a flanged assembly. The Insulation Kits consist of one full-length insulating sleeve, two insulating washers and two steel washers for each of the bolts in the flange assembly. The purpose of the insulating sleeves is to electrically separate the bolts from each side of the flange, while the insulating washers provide electrical insulation for each of the nuts attached to the bolts. This method of insulation provides the user with a high-reliability solution to complete the electrical insulation of a flanged joint.